Kelsey and Kaushal’s wedding was held in Nepal but with all the pomp and fun of a classic Indian wedding. 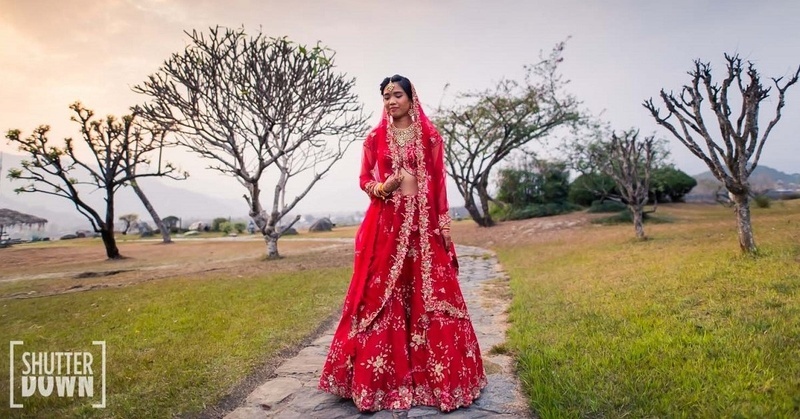 What we especially loved amongst all the wedding details was Kelsey’s gorgeous red lehenga! While red lehengas are overdone, this was one look that was did not tire of. What made it unique is how Kelsey carried it off. Instead of a loud, extravagant look, she went for light and simple make-up. Though we’d expect the make-up to not match up in comparison with the heavy lehenga, the outcome was a stunning combination that balanced out each element beautifully. The lehenga itself was all things bridal, with intricate gold jewellery and floral patterns. We especially love the cut of the blouse! Shutterdown, the team of photographers that shot Kelsey and Kaushal’s wedding did a brilliant job of bringing alive each detail and every moment!